SUMMARY: This is an incredibly useful product for an individual with hearing loss or family members that are forced to watch TV at a level that is not comfortable for them. 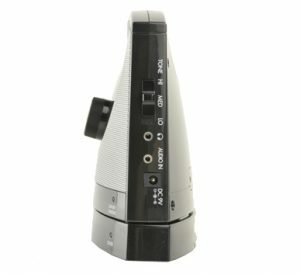 This device will help to eliminate some of the background sounds that are almost always present in TV programming while also clarifying voices. It has excellent range and allows the user to move it from room to room. It is also easy to set up and use. Portable, good sound, easy to use, lightweight and compact. It can be used with or without hearing aids. Great for people who don’t like wearing headphones. CONS: Some users report that the Soundbox interferes with their wireless connection because it operates on a 2.4GHz radio frequency. The TV SoundBox (TV-SB) is a great device to help people with hearing loss hear and understand dialogue on their television better. It is a lightweight, wireless, portable speaker that you put beside you when you are watching TV. The speaker ensures that the sound from the television is directly beside the listener, which helps with better clarity of sound and speech recognition. It is a beneficial product for families who are living with someone with hearing loss who must have the television at full volume to hear what is going on. The Soundbox will help make the TV experience much more enjoyable for everyone. Since it is wireless, you can carry it around with you wherever you go in your house. It has a range of 100 ft. It also uses voice enhancing technology so if you or a loved one have been having trouble understanding muffled voices on TV this will help. The purpose of the Soundbox is to enhance the sound that is coming from the TV. It uses voice enhancing technology, so it is particularly useful for people with hearing loss who have difficulty hearing dialogue or voices. It also effectively reduces background noise that can make it difficult to listen to the TV. You can customize the sound by adjusting the Hi-Med-Low tone control switch, as well as the volume control. You cannot change the base and treble, but this system isn’t designed to be a surround sound system, and that would be more applicable to someone who is looking to create a surround sound type of experience. Depending on how your TV system is set up, the Soundbox should be easy to install. You connect the SoundBox transmitter to your TV, cable box or music system by connecting it to the headphone jack or the audio-out port using the audio cord that comes with the system. If your TV has a digital optical-out port, then you will have to buy a separate TV connector. You leave the receiver on the base to charge it, and then when you are ready to use it, you remove it from the bottom and place it near where you are sitting so the sound will be coming to you directly from the receiver. When you aren’t using the receiver, you put it back on the base to charge. 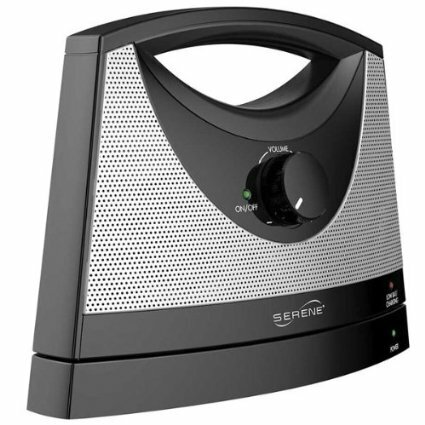 If you have set up a Soundbox you can use it in a number of ways: you can have only TV speaker working, only Sound Box working or TV and Sound Box on at the same time. If you would prefer to use headphones, there is a 3.5mm headphone jack on the side of the speaker. The non-hearing impaired members of the family will be able to watch TV at their average level while the user of the Soundbox can watch TV with their preferred method. The Serene Innovation website has some good setup videos here. This TV speaker has been designed to be light (1.7 lb) and portable. You can quickly pick it up and move it around the house with you. It is an excellent design for people with hearing aids who don’t want to wear headphones or just for anyone in general who doesn’t want to wear headphones. All of the input and controls have clear labels, and the main volume knob is very easy to use. It is not a complicated piece of technology that will take a long time to understand how to use it. You plug it in and turn the volume knob and you are set. If you need to use more than one receiver for each base, that is no problem. 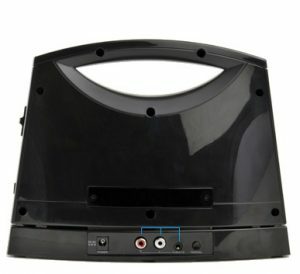 Each base can be used with up to 50 additional receivers, or if you have multiple TVs and would like a different TV-SB for each TV so that people can watch different channels, this is also possible since the paired receiver will automatically tune to and receive sounds from its dedicated Base. The TV SB has a battery life of approximately 8 hours. When the battery light indicates that it is running low, you just place the receiver back onto the base to charge. If you are worried that you will forget to charge the receiver or that the battery life isn’t long enough for you can purchase an AC adapter and plug it into the receiver. It will work as a power source and for recharging the battery. That way, you don’t need to put the receiver on the base for recharging, and you don’t have to rely on the charger system entirely. The battery type that is used is a lithium rechargeable battery, and it is built-in to the receiver, it is not replaceable by the user, and it will last for years. If the battery needs to replaced or serviced, please call the Manufacturers Customer Care Department for instructions. The SoundBox has a one-year manufacturers warranty. If you want more information about it contact Serene Innovations directly at [email protected].